2 March 2018, at 12:00a.m. Modern sows are having more piglets than ever, and feeding those larger litters results in higher body temperatures. Air conditioning farrowing houses isn’t feasible, but Purdue University researchers have a solution: personal pig cooling pads. 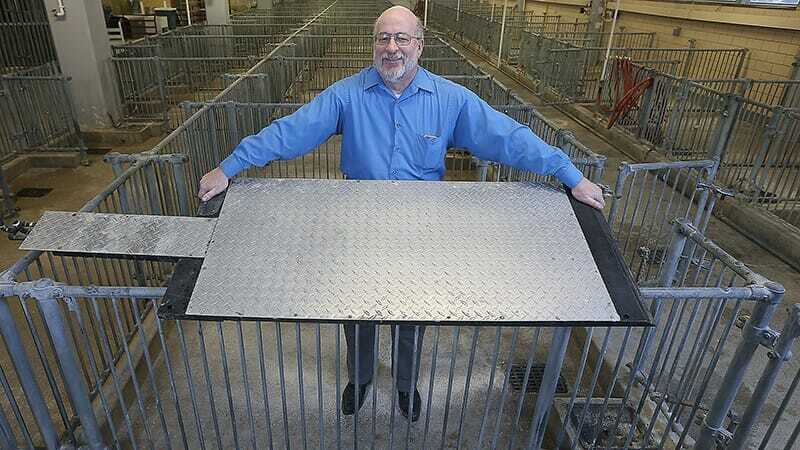 Robert Stwalley, assistant professor in the Department of Agricultural & Biological Engineering at Purdue University, shows a cooling pad designed to keep sows more comfortable during farrowing. With increased litter size, sows increase milk production, and they have to eat more feed to produce that milk. That increases body temperature. Modern sows produce 55 to 70 percent more heat than sows of the early 1980s. Fans can only do so much to cool farrowing houses during hot summers, so sows pant to reduce their body temperature. Doing so, however, burns calories needed to produce milk for the litter. In high humidity, panting employs evaporative cooling in the lungs to reduce body temperature. But when it’s really hot and humid, even panting doesn’t help. The cooling pads, developed by Schinckel and Robert Stwalley, assistant professor in the Department of Agricultural and Biological Engineering, are 2-foot-by-4-foot aluminium tread plates on top of copper pipes that circulate water. Since there is only room for the sow on the pad, piglets that need to stay warm are off the edge while they feed. Sensors in the pad can determine if the sow is getting too hot and circulate new water, cooling the pad again. We have to keep the barns in certain conditions for the piglets or just from an environmental energy standpoint. We can’t air condition pig barns. But we can provide a conductive path under the pad that is enough to cool the animal, but isn’t economically or environmentally counterproductive. Systems that cool entire barn floors can be expensive, requiring entirely new floors. And those systems can take days to cool an entire floor. The cooling pads take minutes to bring down the body temperature of a pig. It’s much more efficient than competitive systems out there that might be trying to cool entire floors. In tests up to 95 degrees Fahrenheit, sow respiration dropped from 100 to 120 breaths per minute to 26. We are cooling the sows down so that they’re far more comfortable. Stwalley, Schinckel and their students have published 10 papers on sow lactation heat production, feed intake and the technology, with more to come. Future studies will include using a calorimeter to determine how much energy is used for panting, other responses to heat stress and the extent to which lactation feed efficiency can be improved by reducing the need for the heat stress responses. They’re also working to find an industry partner to license the technology and produce it for sale to farmers.